I have to confess, I’m not much of a breakfast person. Pretty much the only breakfast I like is one that’s eaten after 11:00, for lunch. I know, I know…it’s the most important meal of the day. Yep. So I make it for my kids sometimes, on the days when they don’t make it themselves…Eldest is King of the Eggs! Here’s a recipe we like that’s fast and easy and has great leftover-recycling potential! I just whisk up some eggs…I usually do two per person. If I’m not making many eggs, the frittata will be thin instead of nice and puffy, but nobody seems to care too much. Add a tablespoon of milk, cream, or milk replacer for every 4 eggs you’re using. I like to add salt, pepper, garlic powder and dill to my eggs, and a little chopped green onion if I have it. Then, snip up some bacon (we use turkey bacon), ham, sausage or turkey and throw it in a cast iron skillet. Here is a great place to recycle some chopped meat from last night’s dinner! NOTE: For you gluten-sensitive people, make sure you don’t let any gluten touch your skillet! I’ve heard that cast iron retains the evil stuff and you may get sick if you cook in it again. Yipes! If you need to make a bigger frittata, you can use a baking dish…just transfer the ingredients from the skillet to the dish. Cook the meat completely if raw, or reheat meat until hot through. Arrange the meat in a layer on the bottom of the pan and turn off the heat. Now you can add other stuff…chopped potato, vegetables of all kinds, diced tomato, fresh basil, grated cheese, feta or blue cheese crumbles, (watch for wheat in that blue cheese!). I love to toss some fresh spinach leaves in. Pour the eggs over everything and pop it into the oven. Bake at 350 until the eggs are set, and the edges are browned and pulling away from the skillet. 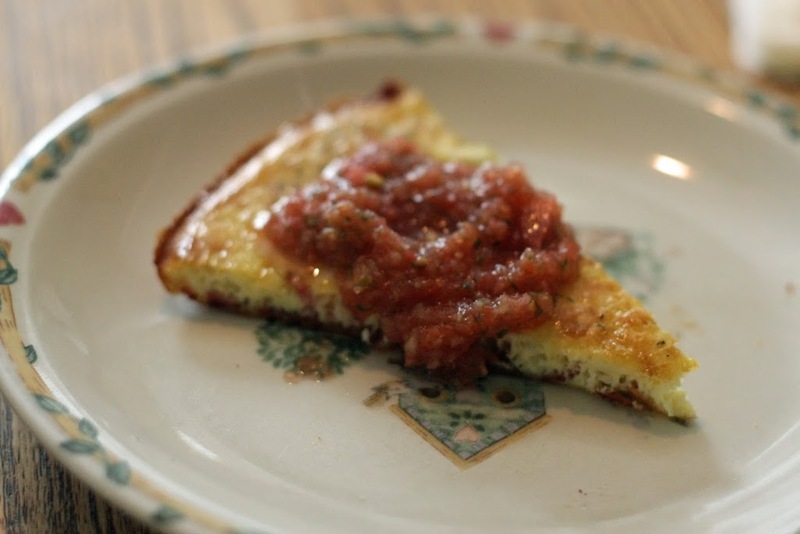 Cut and serve…you can top the slices with cheese, salsa, sour cream, or…Youngest’s choice….ketchup. Ick. Taco Frittata: Add leftover taco meat, green onion, tomatoes, olives, cheese…whatever is left over from your taco dinner last night! Onion and Mushroom: Caramelize onions with a little olive oil, cook mushrooms ’till done, and pour eggs over. Pesto Potato: Cubed cooked red potatoes warmed and tossed with pesto. Mmmmm! Pizza: Cook green peppers in the skillet with a little olive oil. You can leave them in rings and flip the frittata onto a plate when it’s done for effect! Sprinkle chopped pepperoni over the peppers, add some mozzarella and the eggs. Serve with tomato sauce drizzled on top if you’d like!